Most people know nothing about finance, economics, investing, or retirement issues. This is NOT what I do for a living, but it is something that I follow carefully. It is a subject that I think everyone should follow carefully. You cannot just stumble through life and hope things work out. You need a plan. As far as retirement is concerned the best time for you to make a plan is when you are in high school and that plan should be in full motion by the time you are 22 years old. The sooner you start, the sooner your future gray years will be assured. I think I became interested in this topic in my mid twenties. A little too late in my definition, but probably 30 years before most people start to take it seriously. If you look at my recommendations in my Amazon affiliate store, you will quickly notice that I recommend a lot of books from William Bernstein; he is both a clever (self-trained) economist, and brilliant historian (also self-trained). He is as good a writer as I have ever read on the subjects that he tackles. Recently, Bernstein was featured in an article in the New York Times titled, "A Path to Retirement, for Those Far From It." The article is a good place for someone who is thinking about planning their retirement to start. After you read the article go over to Bernstein's homepage and download a copy of his very short and useful guide to investing. The guide: If You Can is free for download, or available on Amazon for $0.99. Either way it is well worth your time. 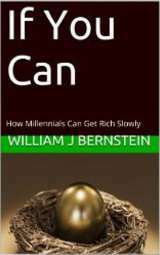 If you want to get the long version, check out one of the Bernstein books I recommend in my Affiliate store (particularly the "Four Pillars of Investing"), if you have only a little time, read "If You Can" as quickly as you can. You will not regret it, unless you refuse to plan.